This might be a weird question but I was asked to make a table for my sister and she wants it made out of hard maple (I tried getting here to choose something different but failed). After spending some time looking at tables, she wants a table with a thicker top 1.5”+. I am having trouble finding some good 8/4 stock to make the table out of locally but there is plenty of 4/4. Is there any problems with laminating 4/4 stock together and using that? Would I be able to flatten and thickness the laminate boards after without weird movement? What about the table top movement due to seasonal changes? Would the inconsistent movement between top/bottom boards cause cupping or twist? The table will have bread board ends so I can hide the end grain. I have a few good 8/4 boards that I would use as the edge boards so as far as I know, nobody would ever know that the interior boards were laminated. Just wanted to bounce this idea off of someone before I do something dumb! If your gonna put edging on all four sides seems kinda silly to laminate the top with hardwood. Make the edging any height you like, it can underhand the top by a bit or add filler strips behind the edging foe 2” or so. Trying to cut corners in woodworking sounds like a recipe for disaster. Unless your sister wants a solid maple top I would forego the bottom piece (you can’t see it unless your on the floor) for a good quality ply. This will solve / mitigate the warping problem. Edge band the sides with maple that is at least 1/4” wider than table is thick and use a sliding dove tails for both ends. The material cost saving – good sales point to your sister. I agree with Stancin. Thicken just the edges. It will save wood, save weight, and eliminate the potential problems with wood movement you mention (even though I think they would be minimal). 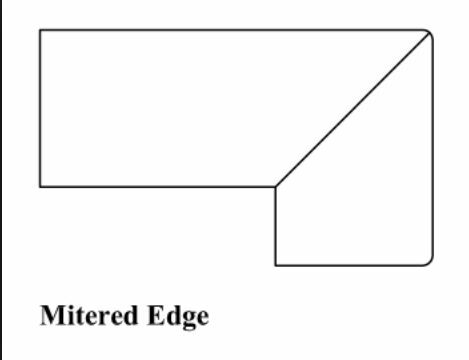 In order to hide the joint line at the thickened edge, you might consider using a miter cut. That way the joint will be masked by the corner. I used this approach (I believe what bilyo is referencing above) to make a seemingly thicker table top for a welcome desk at my church. It worked great, and is still holding up terrifically after a year of use. I don’t think there is any problem gluing up 1” thick stock to other 1” thick stock to make 2” thick stock—as long as it’s the same species (similar expansion/contraction rates) and NOT glued cross grain. But, the one you linked is nice and does a good job of hiding the glue line. I must have missed the ‘cutting corners’ part of the post…where was that? Maybe I’m reading this wrong, but this seems like a train wreck coming. I’ve seen too many instances where family and friends ask for a ‘favour’, but then refuse to accept the fact that you aren’t just there to make them happy. If she’s just thinking she can get a superior table for half the price then there’s a good chance that one of you, likely both are going to have some hard feelings afterwards. That’s something that usually drags a whole bunch of people into the situation on both sides. I’d make sure you really want to do this. It may be easier to ask them to get something at the nearest furniture store. Keep thinking about it Tony you’ll figure it out. Nobody would ever know that the interior boards were 4/4 either. Use your 8/4 pieces for edges and breadboards. Leave the interior 4/4. Saves weight, saves lumber, saves dollars, and still gives your sister the look she wants.